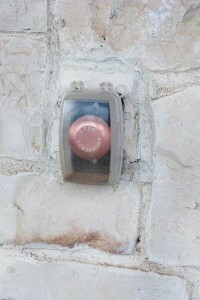 With the new 2011 National Electric Code hitting the streets all over the country, I am often asked, “Are we there yet?” No, this isn’t that yearly trip to the in-laws’ house halfway across the country, with one question seared into your brain that you know you will hear 500 more times before you arrive. It’s the other burning question, Have we finally constructed the descriptive language that will convey the importance of avoiding and, perhaps, finally prevent an unsafe environment when it comes to an emergency in regard to vehicle fuel dispensers or to the servicing and maintenance of vehicle fuel dispensers? Did we cover, at least for now, the latest technologies and integrate them into the requirements of the NEC properly; and did we make provisions to embrace new technologies? I have asked the question and had this same discussion with many of my colleagues. With many facets of the vehicle fueling industry—from manufacturer, installer, and inspector alike—all can agree that the language is much better than before, and our continued discussions are still passionate and filled with many talking points and scenarios that help us understand the intricacies that are involved with the subject. We all have a slightly different take on simultaneous disconnect of all conductors andhowit should be done. Whether we will see a day when simultaneous disconnect can all be handled by a single device or combination of devices the use of which becomes as routine during an installation of a vehicle fueling dispenser as a GFCI is in a dwelling unit still remains to be seen. We are completely in agreement, however, that simultaneous disconnectshouldbe done; and we are still perfecting the verbiage as we follow the industry, and keep our fingers on the pulse and blend technology with safe installation practices and requirements. In the end where will our efforts lead us, will we accomplish the task once and for all and achieve the safe environment we seek to provide? In this latest look at a well-discussed subject, we will visit previous technologies and methods, take a look at current methodologies, and see what the new 2011NECprovisions have in store for the industry in the quest for a safe environment for the servicing and maintenance of vehicle fueling dispensers. 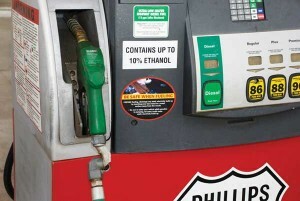 With the many technical advances that have been made to ensure the safe everyday use of modern fuel dispensers in the motor vehicle fueling industry, there still remains the question, “How do we ensure that the requirements in theNational Electrical Codeare being adhered to,” particularly the provisions in NEC 514.11 and 514.13, when there is an emergency, or it’s time for service or maintenance of the fuel dispensers? For many years and still today the practice of field-installed combinations of wiring and equipment that kind of gets the job done is, and has been, normal practice when it comes to simultaneously disconnecting “allconductors of the circuits, including the grounded conductor.” Many of these jobsite solutions are not listed as an assembly, nor have the individual components themselves been listed, labeled, or identified for the application. The days of the old full-service gasoline station of our parents and grandparents have gone the way of the dinosaur; and in its wake, we have the modern self-serve vehicle fueling stations that offer fuel 24 hours a day, 7 days a week, 365 days of the year. These modern service station dispensers of the vehicle fueling world are ready and willing to dispense fuel at a moment’s notice, and while, yes, some things have changed a bit, now you pump your own gas; checking the oil and getting your windows washed are out, but if you have the time there is gas a plenty to be dispensed. Nowadays, however, no one is in attendance at many of these modern vehicle fueling establishments when they are a fuel-only site without a convenience store; and if there were to be an adverse situation that occurred, the e-stops wouldn’t do any good if they are not properly installed and identified, and there is no one there to use them, or they may be installed, wired or modified in an unlisted or tested manner, and fail to perform as expected in an emergency. Conversely, if a person were to be performing service or maintenance on the fuel dispensers, what guarantee is there that the environment is safe for the operation? Who guarantees that all the field-built or modified wiring and equipment will function properly as intended without that third party certification? With the advent of the very latest technologies like pump top advertising via premises-powered LCD screens affixed to the tops of the fuel dispensers, we now have more ignition sources for what might very well be an accident waiting to happen. With the rigorous pace that these new self-service dispensers are required to keep in this economy where every penny counts, it doesn’t leave a lot of time for downtime for service or maintenance. This extended maintenance schedule and the sheer demands on the equipment can cause pumps, seals, and gaskets to fail prematurely, creating a dangerous situation that might affect not only the individual who is servicing or maintaining the dispenser, but also the everyday user. So what do we do? 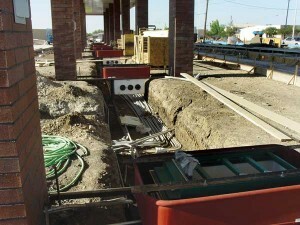 Many vehicle fueling stations run just fine, utilizing methods that have been field-wired to achieve a simultaneous disconnect of the conductors that were thought to be current-carrying or at least carrying enough current to cause a concern. Some critics will even hold that as long as the line voltage is disconnected the low-voltage circuits are of little or no concern. Is this true? If there is no listed and labeled device or a known piece of utilization equipment that can fulfill the requirements for maintenance disconnects for fuel dispensers, what is the solution? Let’s look at what has been done to satisfy this requirement. All manner of shunt trip devices, contactors, and the like were used in many vehicle fueling stations and are still used today. The issue here is that there is no guarantee that these field-wired, unlisted and untested methods would hold up to the environment to which they were subjected or that they could actually perform to an established product standard. Certainly, one would not want to install such an arrangement of wiring and devices knowing that there is, or even could be, the potential for serious damage or loss of life. Without applying even the basic premises of theNECand certainly starting at 110.3(A) and following through with 110.3(B) at the very minimum, there is no way for anyone to be sure of the performance of these methods. Many installers and inspectors alike have throughout the years applied their own brand of interpretation to the subject and a lot of the time best practices and methods prevailed where there was lack of consensus on the requirements; many of those installations exist today. Photo 5. 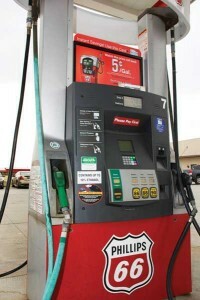 Technology has led the user to believe that vehicle fueling facilities are safe and foolproof. Slide the card, pump the gas. But safety still needs to prevail at maintenance time. Notwithstanding that proper plans were drawn up and submitted, ultimately reviewed, and are now on a jobsite ready for implementation, the question is still there. Now with new verbiage in the 2011NEC, can we finally say with certainty that we have enough language in the requirement to ensure that level of safety? Can we ensure with this new language that when the green tags are all affixed, we are starting out with a better installation that will ensure a safer environment? I think so. We now have very strong, yet simple, language — “All associated power, communications, data, and video circuits”— added to the mix and it certainly quantifies which circuits and conductors are to be simultaneously disconnected. This language should be clear to the reader and should assist the installer and inspector alike in providing that safe environment for vehicle fueling establishments. There is no more discussion about types or amounts of voltage, about what will make a spark and what won’t — everything gets disconnected now. that the other two elements are controlled or removed from the equation. Let’s look at the service and maintenance side covered inNEC514.13. Once again we have strong and effective, yet simple, language. “Each dispenser deviceshallbe provided with a means to removeall external voltage sources, including power, communications, data, and video circuits, and including feedback, during maintenance and servicing of the equipment.” This is the language that was discussed and started in past code cycles by the many authorities from the fuel industry, reviewed and amended by today’s authorities and code panel members and forged into finite, yet all encompassing, language that will take into account the new technologies that are no doubt on their way. I think that it is clear to the reader that the question has been answered and that even the elements of ignition themselves have been spelled out, leaving very little ambiguity or discussion at this point. Until new sciences and technologies emerge, we have gained a solid foothold on just how to ensure the safe environment that the industry demands for installer, inspector, and consumer. Photo 6. Signs warn users not to mix fuel with any source of electricity. 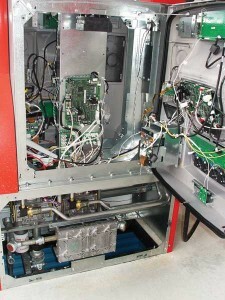 Static discharge in dryer climates has become problematic. There is always a since of urgency when it comes to electrical safety, and particularly when we deal with hazardous (classified) locations. Keeping up with industry is a daunting task in and of itself, much less making sure that there is adequate language to enforce the requirements necessary to ensure safe environments. The electrical industry as a whole works diligently — year after year, code cycle after code cycle — to actively provide for a safe working environment not only for themselves but for all who will come into contact with electricity. 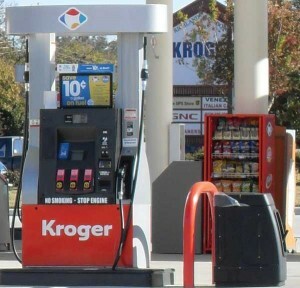 In this article, we have examined the immediate hazards of the dispenser in the vehicle fueling environment and the ultimate goal of the industry. We have seen what has transpired in the past due to the lack of hard-hitting language, the lack of critical code requirements and the lack of communication throughout the industry added to the extreme pace of the technological advancements in the dispenser industry. We have also seen the strong response and formidable answer handed down from the fueling and electrical industry professionals by way of the code-making panel and theNECgoing the distance and taking another hard concentrated look at how to clarify, to maximize and to convey the language required to assist the installer and inspector alike, and providing that language to ensure the safe environments that we have come to expect, where time is precious and maximization of that time is the ultimate goal.